Bob asked why I am thinking of moving on from my Eee 701. I have been using it as my only t’interweb machine for the last 6 months. There are a couple of very specific things I need Windows and IE for, and that amounts to less than once a month, those are the only times I don’t use my Eee for Web business. As my Windows box failed last time I tried to do an Office live meeting, or net meeting or whatever its called this week, even thats not a massive use. I find that quite incredible – basically if I did anything for a living other than Microsoft/Windows/Excel/Visual Studio dev I would have no need for Windows, or any other MS product probably. Its one of the reasons I keep trying to prod MS to provide users with a compelling story. This situation would have been unheard of a few years ago. The spec is totally standard 512 Mb RAM, 4GB SSD and the standard Linux distro. I use a 19″ monitor and an ergo keyboard (MS) and mouse. And in that set up the only issue is lack of horse power for stuff like all the new flash BBC content I have had a few crashes with content from Failblog too. Often it runs at 10 or less or zero Mb of RAM free and Open Office can take an age to open. Its needs more RAM and a faster proc too I reckon. The screen at 7″ is just too small for extended use, especially spreadsheeting. I’ve done doc reviewing and it works well, but for grid stuff or IDE stuff its too small. But it will drive an external display up to 1600 x 1200. Presenting doesn’t work well when the machine screen and the projected one are at 2 different resolutions, ok for ppt yawnathons, but for interactive stuff it makes your head explode. The new breed are 8.9″ which I think will make all the difference. This is the key factor on changing it, if it had a 9″ screen I would just add RAM. Its great to carry around because its small, light, tough and replaceable. The other issue is Linux distro, I’m still a noob having no real need to delve into the OS to get everything done I needed to on my Eee. But as I understand it if I were running a more common distie then there is a wider choice of apps ready compiled to drop in. eg I don’t think GIMP2 is available for the Eee Linux, or the latest OOo. So I’m thinking Ubuntu or SLED. In fairness I do have other machines that dual boot into those. But for 200 quid I’d rather keep those as they are and get an Acer Aspire one. I think these netbooks are going to be the net appliances that Larry Ellison has been dreaming of for years. And MS don’t really seem to have anything for them. You can use their deprecated OS that is no longer for sale at retail (win XP), Vista the ‘operating system’ needs too many resources to operate these systems. As of Jan 14 2009 the only fully supported MS productivity suite will require at least 25% of the available vertical pixels for its ‘user experience’ (that would be cramped, wasteful, struggling to find commands, and can’t find the work because the effluent UI is in the way). Hints are this numpty UI will infect Visual Studio v.next, making that unusable, in general, and on smaller screens in particular. Anyone got a Windows sub notebook? Anyone see value here for Office devs? Ars covers the point Tom made recently about the rather vital issue of actually getting your app on App Store. In the meantime I’m looking for a netbook with Ubuntu on it and a proper set of status lights (excludes the new Dell sadly). I looked at the Acer, which has Bagpuss Linux on it or something, and is a major trauma to get Ubuntu running. We’ll see, I have organised an exit strategy from my Eee, which has been a superb buy. If the HP wasn’t 100 quid over the SCC (small cheap computer) price point I’d get that as it has a great keyboard and SLED is a totally acceptable alternative to Ubuntu (unlike the pink and cream stripey Linpus). SLED also has one of the best VBA versions of OpenOffice so thats a thought. Apologies to anyone who can see the point of his antics, for me the pointlessness is surpassed only by the pointlessness. There will be at least one Excel event, possibly more in 2009. At some point between March and May we are planning to arrange a free one day event, hosted by our friends at Microsoft. At some point over the summer/autumn we are hoping to sort out a 2/3 day more in depth event. More details to follow, but at least you know there will be some events coming up. I have put a post here asking for potential presenters, and topics. One big one? or lots of small ones? My question is this, would you prefer a fairly complex, but comprehensive tool (add-in) that did all of them. Or a set of half a dozen smaller ones that you load/unload as required? I guess tools like PUP do both, but I’m thinking more at the UI level. If the functionality is used often together, then a single tool makes sense. But I have lots of little ones I just load, run and close (well, find it first of course ;-)) I don’t like having my UI cluttered up with tons of stuff I’m not going to use in the near future. (like a big daft COPY/PASTE button for example, tee hee). And I’m quite happy to need a bit more effort to find and open stuff as a trade off for cleaner UI. What about you? Whats your approach or preference? “This is an exclusive opportunity to join one of the world’s leading insurance specialists who requires an experienced SQL Server Developer to join their reporting team. Of course its bloody exclusive! its a flippin’ job – 1 person gets it no one else does, FFS. We all know these dipshit recruitment nodders are thinly disguised (or not) sales reps, but seriously who writes copy like that for a job ad? I’m scared they are going to start phoning me at funny times of the day and hassling me with ‘2 for the price of one if I sign today’ offers. Exclusive is such a non word these days, like solution, world class, market leading all truly pointless combinations of characters that can be left right out to make sentences easier to understand. Anyone else getting OTT sales blather from agencies? Anyone got any more non words? – working model controls, version control and secure archiving. controls over end-user computing, will be particularly welcome. In smaller models all those elements are implemented with VBA and worksheets, in medium size ones some code may move elsewhere, and the data table ends up as an .mdb. 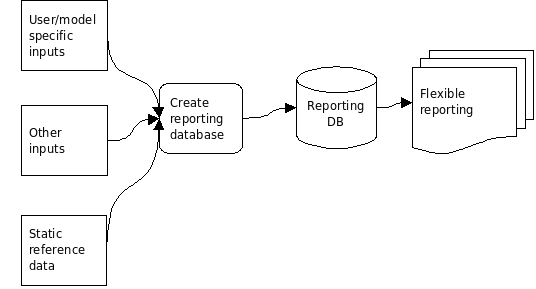 In big systems the guts of it ends up in some OLAP server like Analysis services or Essbase. And the sources may be in DB2 or whatever. If possible I aim for reporting to be pivot table based, that way as long as I get the data right all the reporting should be trivial (emphasis on should!). I can’t remember the last time I wrote a big complex mainly formula based reporting/analysis app. As soon as the client wants multiple views (say monthly and annual) I am thinking big table driven pivots. Do you find a lot of the stuff you do forming into patterns? 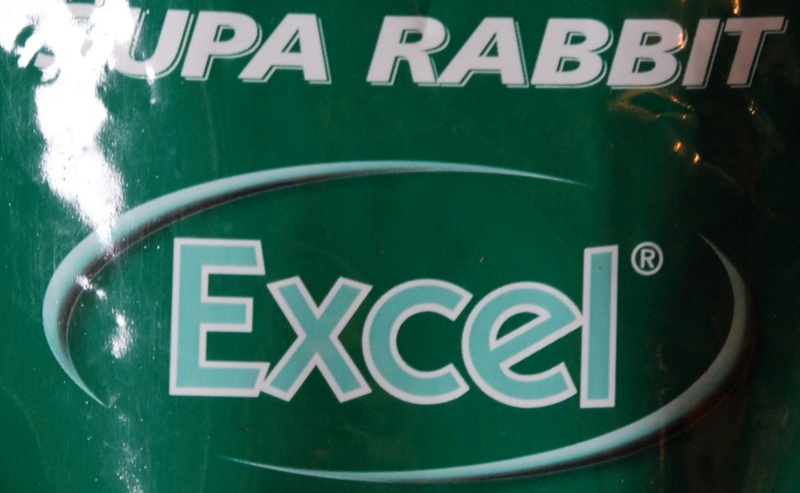 Great to see Mrs Smurf is as much an Excel fan as me – she got this for the rabbits. We all agree the food looks like rabbit poop (I’ll avoid any cheap UI jibes here). Charley Kyd over at ExcelUser has been running a survey on the popularity and effectiveness of the effluent UI. No surprises for any non Microsoft employees – most people hate or dislike it (please chip in with your view). Of course that doesn’t matter, it wasn’t introduced for users, I have no idea why they did it. As a matter of interest, why does every Office App need the same UI? they are not used by the same people to do the same job so why? its not just marketing branding is it? Who is not ever ever going to migrate to Excel 2007 or 14 (or 15)? Unless people move away from Excel and MS Office in vast numbers then the ribbon isn’t a mistake is it? So what if everyone hates it – as long as they pay for it, so what? right? Lots of people were traumatised by the VB6-ectomy but I don’t see any financial damage (to MS) – do you? ‘Hate it, but still using it’ is fundamentally different to ‘hate it, have sacked MS Office off, and probably leaving Windows too’. Unfortunately for Microsoft (and much of the eco system previous generations worked so hard to nurture) they made this play at a bad time, Apple are completely eating their lunch on the desktop, they have no current operating system or application stack to work with the wildly popular new breed of (mainly Linux) sub-notebooks. And Google is kicking them in the googles all over t’intarweb. I have no idea how much real damage this fiasco will cause, I suspect not much in the corporate space. And equally home users probably aren’t that fussed about Excel UI disasters. So lots of people unhappy, no real financial impact (possible income delay I guess as people put off the pain). What do you think? Bear in mind Office 2007 has been out for almost 2 years (released Nov 06 if I remember rightly). I think farting around with Yahoo has had a bigger negative impact.